Ketton Lions celebrate their success in the Rutland Twenty/20 Final. Ketton Lions won the Vitas Cricket Rutland Twenty/20 Trophy last night (July 3) with a comfortable 32-run success over Uppingham at Oakham. 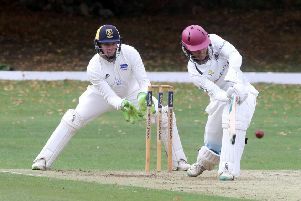 Opener Shakaar Mahmood (72) and Aussie Ben Bryant (58) did the bulk of the scoring in Ketton’s 165-6 before slow bowlers Ulrich Van Duyker and Matt Milner claimed eight wickets between them as Uppingham closed on 133-9. Van Duyker’s early wickets on his way to 4-12 from four overs pretty much sealed Ketton’s victory early in the Uppingham innings. Uppingham had been chasing a fourth successive victory in the Rutland Twenty/20, but instead lost to a team skippered by the competition’s sponsor, Rob Vitas. Ketton next face a Stamford KO Shield semi-final at Market Deeping on Monday (July 6, 6pm) when they will be without Bryant who is on Minor Counties duty with Cambs. Nassington host King’s Keys in the other semi-final. Uppingham also lost in the Stamford Charity Cup Final to Nassington last Monday (June 29). Ketton Lions 165-6 (S. Mahmood 72, B. Bryant 58). Uppingham 133-9 (U. Van Duyker 4-12, M. Milner 4-37).